Conservation and Recreation Groups Oppose Due to Impacts on Fish, Water Quality and Recreation. Portland, OR – On August 22, 2017, the Forest Service issued a draft decision consenting to exploratory drilling in the Green River valley, just outside the Mount St. Helens National Volcanic Monument. A coalition of over 20 conservation and recreation groups opposes the project, claiming mining exploration and development will significantly harm wild steelhead populations in the Green River, destroy recreational opportunities in the area, and pollute the water supply of downstream communities. The draft decision begins a 45-day objection period. Drilling permits would allow a Canadian mining company, Ascot Resources Ltd., to drill 63 drill holes from 23 drill pads to locate deposits of copper, gold, and molybdenum. 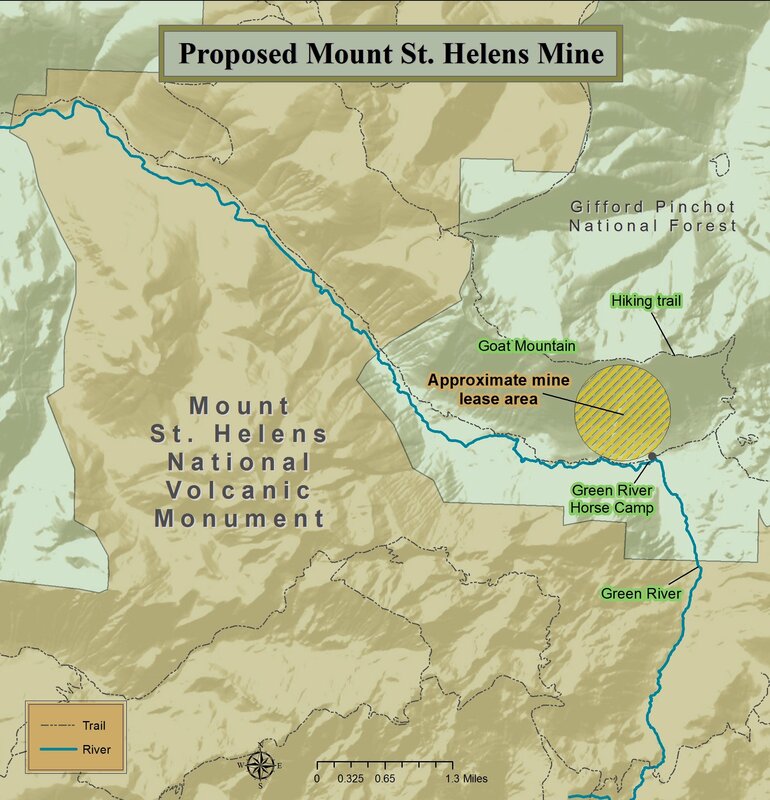 The project would include extensive industrial mining operations 24/7 throughout the summer months on roughly 900 acres of public lands in the Green River valley, just outside the northeast border of the Monument. The prospecting permits allow for constant drilling operations, the installation of drilling-related structures and facilities, the reconstruction of 1.69 miles of decommissioned roads, and pumping up to 5,000 gallons of groundwater per day. Some parcels of land in question were acquired to promote recreation and conservation under the Land and Water Conservation Fund Act (LWCFA). In a previous lawsuit filed by the Cascade Forest Conservancy (then the Gifford Pinchot Task Force), a federal judge invalidated Ascot’s drilling permits and held that the agencies violated the LWCFA by failing to recognize that mining development cannot interfere with the outdoor recreational purposes for which the land was acquired. The decision by the BLM and Forest Service to once again issue Ascot drilling permits follows the release of a modified EA earlier this year, prepared in response to this prior court decision. The pristine Green River flows through the Mount St. Helens National Volcanic Monument, passing through old growth as well as a unique post-eruption environment that provides habitat for a variety of native fish and wildlife. The Green River flows into the North Fork Toutle River and Cowlitz River, which provides drinking water to thousands of people in downstream communities. The city of Kelso recently passed a resolution against the mine because of impacts from leaking mine effluent and failed toxic tailings ponds that would result from locating a mine in an active volcanic zone.